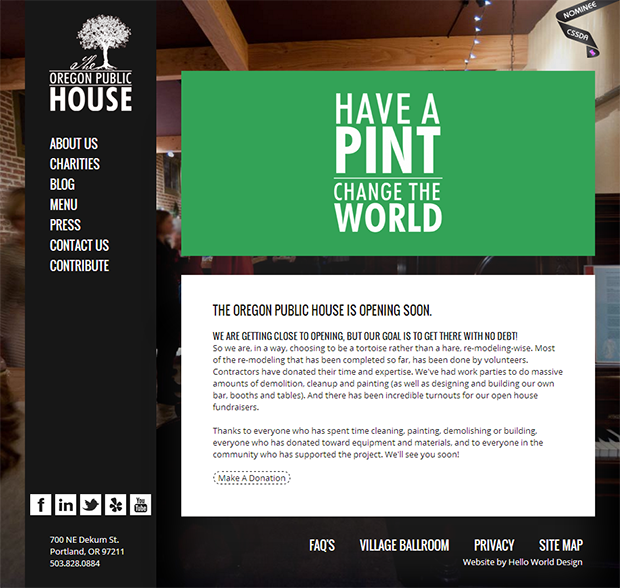 Hello World Design Launches oregonpublichouse.com! Portland has more breweries per capita and more non-profit organizations per capita than any other city in America, so it makes sense to bring the two together. Have a Pint: Change the World. That's the mission of the Oregon Public House, where you can enjoy good food, craft beer, and help your community. 100% of net profits go to local charities. They've made drinking more into the socially responsible thing to do. And if you want to donate to the oregon public house, you can get free beer for life when you sign up as a Founder. The site includes a rotating tap list, full menu, information about upcoming events, and profiles of their partnered charities. Restaurant customers can learn more about each charity before choosing one - you can request that the profits from your order go to a specific charity from a short list in the pub. Oregon Public House is a family-friendly restaurant located in a 100+ year old building in north Portland at 700 NE Dekum Street. The donations system is custom-built to be extremely lightweight, fast, and easy to use. Overall this was a really fun project, they had so many great photos for us to work with.